Sammy Mandell (aka Samuel Mandella; February 5, 1904 – November 7, 1967) was a World lightweight boxing champion from 1926-1930. Born Salvatore Mandala, he was known as the "Rockford Sheik" due to his Rudolph Valentino like good looks and as the "Rockford Flash" due to his fast hands and foot speed. Statistical boxing website BoxRec ranks Mandell as the 13th greatest lightweight boxer to have ever lived. He was inducted into the International Boxing Hall of Fame in 1998. Mandell developed his fighting skills at the Camp Grant barracks in Rockford, Illinois. He was too young and underweight to join the army, weighing 105 lbs. Despite this, his persistence in hanging around the wrestling and boxing training areas saw him gain permission to join in with the military personnel. 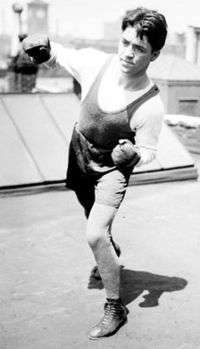 The camp boxing instructor at the time was Fred Dyer, "The Singing Boxer," who recalled in a 1926 interview how Mandell beat every soldier in the bantamweight class and was able to best men 10 lbs heavier than him. Dyer also stated that he advised Mandell to turn professional. On July 17, 1925, future champion Mandell fought Solly Seeman in East Chicago, Indiana. Seeman knocked down Mandell in the first round, and in the opinion of many ringside had the edge throughout the bout. Trained by the legendary Jack Blackburn, Mandell was an outstanding, clever fighter who carried a solid punch, fast hands and superb defensive skills. He won the championship when he outpointed Rocky Kansas on July 3, 1926. He successfully defended his crown against hall of famers and future champions Tony Canzoneri and Jimmy McLarnin. In a startling upset, Mandell lost the crown when he was KOed by Al Singer in the first round. Loss Al Singer KO 1 (15), 1:46 1930-07-17 Yankee Stadium, Bronx, New York Lost World Lightweight Title. Win Tony Canzoneri SD 10 1929-08-02 Chicago Stadium, Chicago, Illinois Retained World Lightweight Title. 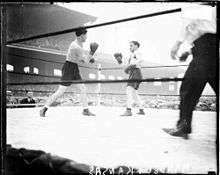 Win Jimmy McLarnin UD 15 1928-05-21 Polo Grounds, New York, New York Retained World Lightweight Title. Win Rocky Kansas PTS 10 1926-07-03 Comiskey Park, Chicago, Illinois Won World Lightweight Title. 1 2 "Sammy Mandell Bio". International Boxing Hall of Fame. Retrieved 23 September 2013. ↑ "All-Time Lightweight Rankings". BoxRec. Retrieved 5 May 2014. ↑ "Mandell Got Bunch of Bananas for One Bout". The Border Cities Star. 8 June 1927. Retrieved 12 April 2012. ↑ "Solly Seeman". BoxRec. Retrieved 21 May 2015. ↑ Sammy Mandell's Professional Boxing Record. BoxRec.com. Retrieved on 2014-05-18.